My Persian Kitchen was created out of a deep love for Persian cuisine and culture, and to showcase this rich aspect of the Iranian heritage. Sanam Lamborn, aka The Chef, was born in Iran and currently lives in Los Angeles. Sanam’s first exposure to cooking was a in her grandmother’s kitchen, who was indeed her inspiration. What started as being a little helper turned into a life long love affair with cooking. 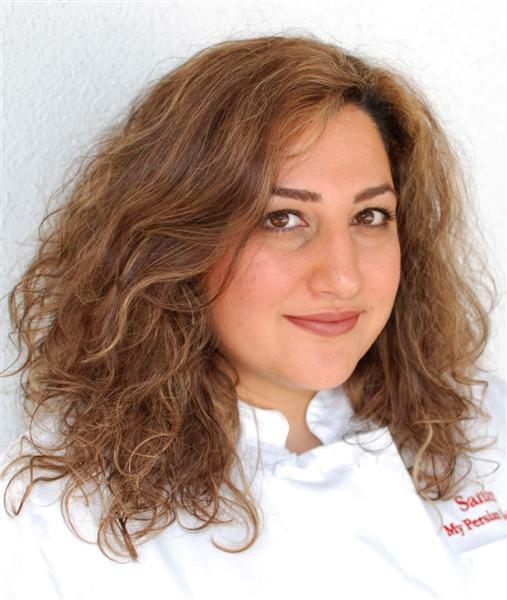 For many years Sanam enjoyed eating Persian food made by the experts around her refusing to endure the task herself, as she thought it was too intimidating of a venture. One fine day she decided that it was time to tackle the beast by the head. Much to the disgrace of every Persian, she first had to learn how to make Persian rice. It took a few disastrous attempts, which included loud cussing and pans flying across the kitchen, resulting in a very sorry, mushy, and pathetic looking rice. She has now mastered rice making and has risen above defeat! Sanam soon realized that while at times time consuming, she really enjoyed making dishes from her homeland and sharing the results with family and friends. Sanam holds a BA and MA in English as well as a Professional Cooking Certificate. Jonathan, aka The Sous Chef, is often mentioned around here. Before meeting Sanam he had never had any exposure to Persians or Persian food. Sanam thought to herself: “Oh you poor lamb, I will show you; I will enlighten you!” She then made sure to introduce him to her culture and cuisine. 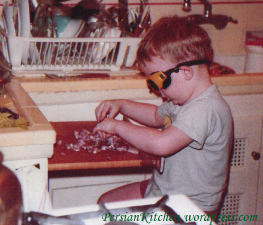 The Sous Chef thoroughly enjoys Persian food and has learned to make a few dishes on his own. In fact, he has become so good that when frequenting Persian restaurants he can detect good, and not so good, Persian cuisine. When ordering authentic Persian dishes, which are not always liked by Westerners, he is occasionally given a worried look by the waiter…little do they know! The Chef and The Sous Chef are currently happily married. Indi, aka The Taste Tester, aka The Four Legged Kitchen Vacuum, aka The Dog, is an American Staffordshire Terrier mixed with Labrador. She loves Basmati rice and homemade Lavashak. One of the luckiest days of her life was when a piece of kotlet fell on the floor. She day dreams about the day that she comes across another piece of kotlet on the floor, accidentally of course! Hi Guys ,love your cooking(-: It`s awsome. thanks for stopping by! You are awesome! I love the recepies!! I am sure my husband will thank you too! And I would love to hear all about your cooking sessions!!! Thanks for leaving a comment! Wow, love your kashkeh bademjoon recipe! Thanks! Thanks for the kind comment Autoosa! It was fun to make and it actually was really good! What a great resource! I’m very happy to have stumbled upon your website. I have a passion for cooking and recreational eating and being of Iranian descent (both my parents were born and raised in Iran), Persian food has a very special place in my own heart. I look forward to reading more updates on your culinary adventures! thanks for your kind comments. They truly are culinary adventures!!! Happy reading! I’m so glad I found you! I’m intrested in learning how to cook Persian food and I was wondering if you could give me some guidance. Can you reccommend a cookbook and supplier, an easy dish to start with? I liked to start with your stew recipes they look delicious. Very glad to find your blog. So you’re my neighbor, eh? Shhh!!! don’t tell anyone that we are neighbors!!! you have two blogs! Very cool! Thanks for stopping by Lori. OK must go salivate over your posts now! hello guys.. this is my first visit here and i find this blog very interesting.. i rili like the unique way you present the recipes and the photography is excellent keep up the great work.. cant wait to try out the fabulous recipes found here.. keep up the great work.. cheers!! thanks for stopping by Nora. Let me know which recipe you make and how you like it! I’ve been looking for a website like this for YEARS! Awesome. Hi Sheila thank you for finding us!!! Hello I love your website, I was wondering if you could do a request? I had a hard time making Lubia polow & would love to see you make it. I love this website, and love cooking Persian food, and your website helps a lot! you and me both. I love Lubia polow but it has been a challenge. But have no fears, I am not giving up. I will try making it until I get it right. I am not entirely sure about this type of sandwich. I can’t think of anything Persian that resembles a philly sandwich. How about the good old kababe koubideh, nane-lavash, and the greens! Wow…I goto to go eat now! Don’t forget the Dough. PFS – Persian Philly Stake – here I come! ohhh that’s what a Persian Philly Steak is? Kubideh is in the works, the greens have been shot and need to be posted. I just found this blog and I LOVE it. Thank you Sara. Glad you have found us and that you enjoy the site.